Background: The p7-transactivated protein1 of Hepatitis C virus is a small integral membrane protein of 127 amino acids, which is crucial for assembly and release of infectious virions. Ab initio or comparative modelling, is an essential tool to solve the problem of protein structure prediction and to comprehend the physicochemical fundamental of how proteins fold in nature. Results: Only one domain (1-127) of p7-transactivated protein1 has been predicted using the systematic in silico approach, ThreaDom. I-TASSER was ranked as the best server for full-length 3-D protein structural predictions of p7-transactivated protein1 where the benchmarked scoring system such as C-score, TM-score, RMSD and Z-score are used to obtain quantitative assessments of the I-TASSER models. Scanning protein motif databases, along with secondary and surface accessibility predictions integrated with post translational modification sites (PTMs) prediction revealed functional and protein binding motifs. 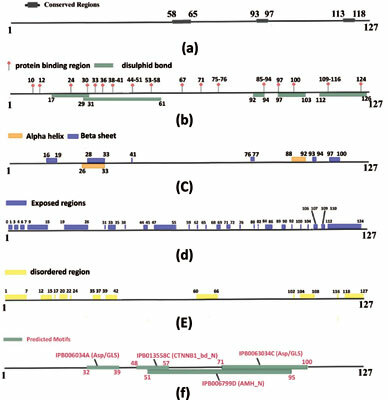 Three protein binding motifs (two Asp/Glutamnse, CTNNB1- bd_N) with high sequence conservation and two PTMs prediction: Camp_phospho_site and Myristyl site were predicted using BLOCKS and PROSITE scan. These motifs and PTMs were related to the function of p7-transactivated protein1 protein in inducing ion channel/pore and release of infectious virions. Using SCOP, only one hit matched protein sequence at 71-120 was classified as small proteins and FYVE/PHD zinc finger superfamily. Conclusion: Integrating this information about the p7-transactivated protein1 with SCOP and CATH annotations of the templates facilitates the assignment of structure–function/ evolution relationships to the known and the newly determined protein structures. Keywords: Hepatitis C virus, p7-transactivated protein1, Ab initio, protein structure prediction, motifs and PTMs. Keywords:Hepatitis C virus, p7-transactivated protein1, Ab initio, protein structure prediction, motifs and PTMs. Abstract:Background: The p7-transactivated protein1 of Hepatitis C virus is a small integral membrane protein of 127 amino acids, which is crucial for assembly and release of infectious virions. Ab initio or comparative modelling, is an essential tool to solve the problem of protein structure prediction and to comprehend the physicochemical fundamental of how proteins fold in nature.